This past Christmas I was gifted a pair of Simple Shoes. These are shoes that I would not have previously purchased on my own, but after a few months of road-testing this gift I will for sure purchase another pair of Simple Shoes. These shoes are stylish and comfortable, but the best part is the story behind the shoes. This shoe is equal to any of my other shoes in stylishness and wearability, but it's a superior product because of its gentle impact on the earth. 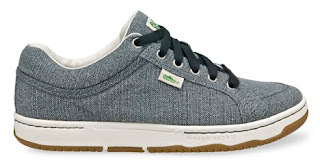 "Organic Cotton sneaker with certified organic cotton, no animal products or even animal byproducts were used on the shoes. The sole of the shoe is biodegradable! The Eco-Pure additive makes the EVA and rubber biodegrade in 20 years in a landfill or compost heap. Water based glue is used to hold the shoe together, not petroleum based- just another way to reduce our dependence on petroleum, and it also means no nasty smelling glue for the people who put your shoes together. The foot form inserts are made of post consumer recycled paper, and the shoebox made of post-consumer recycled paper, soy based printing ink, natural latex and starch based glue." I encourage you to to road test a pair of Simple Shoes! They are affordable, comfortable, and biodegradable. What's not to love? !